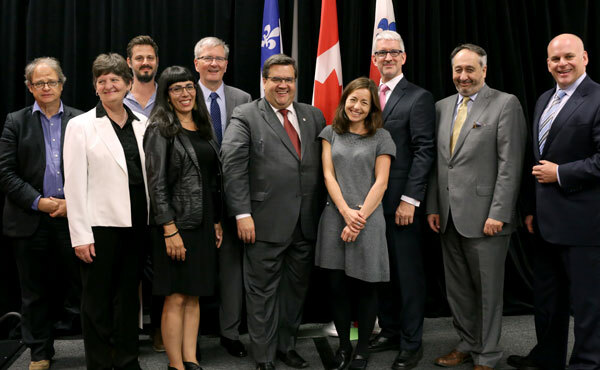 Eight partners, including HEC Montréal, announced the creation of the Social Innovation Centre, with the goal of creating, consolidating and expanding on social innovations by offering an environment for mobilizing resources, co-ordinating efforts and sharing local, national and international expertise. Its services will include a reference and expertise centre, a social innovation incubator and a training and research laboratory. The partners in the project, to be launched this fall, are the Chantier de l’économie sociale, the Fondation Mirella et Lino Saputo, the J.W. McConnell Family Foundation, HEC Montréal, Concordia University, Esplanade, the TIESS (Innovative Regions in Social and Solidarity Economy) and the CIRODD (Interdisciplinary Research Centre on Sustainable Development Operationalization). The Centre will support entrepreneurs in their efforts to create, develop and grow businesses with a social impact. It will also work to advance knowledge and provide training, an area in which HEC Montréal and Concordia University will play a major role. “HEC Montréal is proud to participate in the creation of the Social Innovation Centre. Through our IDEOS research centre and our academic programs, including our MSc in Management in the context of social innovation, HEC Montréal is already contributing to training, research and the creation of a solid new generation of social innovation in Quebec. We hope to continue these efforts with partners from the Social Innovation Centre to make Quebec even stronger as an international leader in social innovation,” said Michel Patry, Director of HEC Montréal. The School’s IDEOS centre will play an active part in the new Centre’s activities. IDEOS develops applied research, training, coaching and knowledge transfer projects in order to improve the management and governance of social or community-based companies and organizations.